When you think about it, tasting a really good craft beer isn’t all that different from tasting a fine wine. The process is about the same. You want to know where it’s from and who made it. Once it’s poured into your glass, you examine the color, maybe hold it up to the light and look through it. Next, you give it a sniff to try to pick out notes of chocolate or oranges or coffee. Then it’s time to sip it, swirl it around in your mouth. What other flavors can you pick up? There is a difference, though, between tasting beer and tasting wine. Unlike wine, beer must be swallowed to fully appreciate its taste. Let’s just say at beer tastings, a spit bucket is a lot less common. Craft beer, by most definitions, is beer brewed by a small, independent brewery. (See here for a more in-depth explanation.) To put it another way, craft beers come from any microbrewery that strives for creativity and innovation, and have little or nothing to do with Anheuser-Busch or MillerCoors. Henry Joseph, 30, has been bartending at The Pony Bar, a craft beer bar in Manhattan’s Hell’s Kitchen, since it opened in April 2009. “The neighborhood was underserved for craft beers,” Henry says. Unlike most bars, where craft beer tends to be the most expensive beer on the menu, The Pony Bar keeps it simple: all beers cost $5. To further entice its patrons to experiment with new beers, The Pony Bar’s All American program rewards anyone who tries 100 different draft beers (not necessarily in one sitting) with a Pony Bar shirt and their name on the All American plaque and on the website. To date, 440 people have completed a 100-beer cycle. 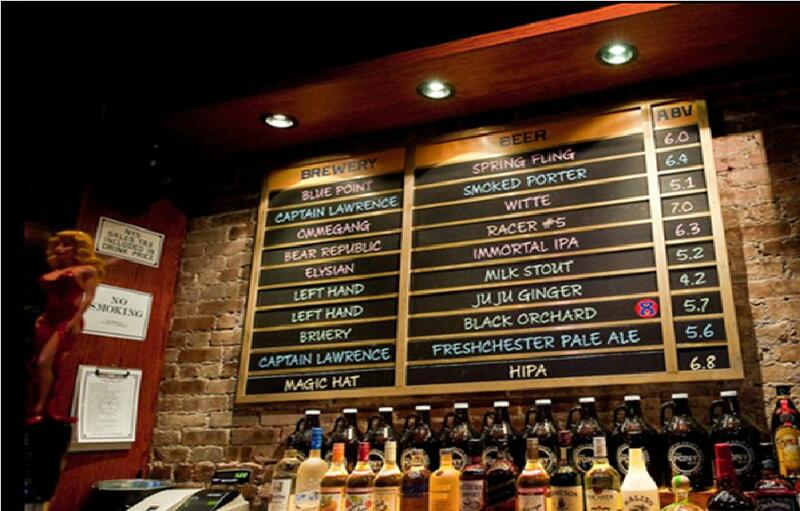 The Pony Bar’s star attraction is the two-part menu board hanging on the wall behind the bar: a list of 20 American craft beers on tap, which rotates as often as a keg is kicked. Each line on the list has the name of the brewery, the name of the beer, and the alcohol by volume (ABV)—most beers are served in 14 oz. glasses, with higher alcohol brews served in 8 oz. glasses. For non-craft beer drinkers, The Pony Bar also serves liquor and wine, as well as Bud and Bud Light bottles. Theme nights at The Pony Bar include “Rocky Mountain High,” during which they only serve Colorado beers. They also run “Tap Takeovers,” which feature beers from one brewery all night. Previous Tap Takeovers have included Sixpoint, Lagunitas, Stone, Victory and Southern Tier. It’s also a good place to find the latest American seasonal beers, such as pumpkin ales during October. Southern Tier’s Pumpking Imperial Pumpkin Ale has been a big hit this year. “We can’t sell enough Southern Tier pumpkin,” Henry says. The menu board at The Pony Bar (courtesy of theponybar.com). It’s an exciting and pivotal time for the craft beer business. According to the Brewers Association, the craft beer industry was worth $7.6 billion in 2010. Yet craft beer’s undisputed heavyweight champion, The Boston Brewing Company (which brews Samuel Adams) made up less than 1% of all beer sales in the U.S. in 2010. This past March, the craft beer industry made headlines when Chicago-based Goose Island sold to Anheuser-Busch (AB) for $38.8 million. While many craft beer drinkers have mixed feelings about Goose Island’s decision to sell, the deal drew national attention to the brand and shortly after the announcement, Goose Island six-packs started appearing more frequently in the beer aisle of my local grocery store. The truth is the lines have been blurred for a while now. Craft Brewers Alliance, which sold its $16.3 million share of Goose Island to AB, still owns smaller outfits including Redhook Ale Brewery, Kona Brewing Company, and Widmer Brothers. This past October, Terrapin Beer Co. sold a minority share to Miller Coors in an effort to fund a $4.5 million expansion project. And Blue Moon, which makes its signature Belgian-style wheat ale as well as several seasonal variations, has been brewed by Coors since its inception in 1995. And for other do-it-yourselfers out there, craft beer is more accessible than ever in terms of homebrewing. Amateur brewmasters can replicate their favorite beers just as an amateur baker would follow a recipe in a Paula Dean cookbook. Or, if they’re feeling adventurous, they could put their own unique twist on an old classic. It seems like every guy I know is brewing his own beer these days, I say to Henry. “Those kids in Brooklyn, now…you can buy one-gallon [craft beer] kits,” Henry says. “The holiday markets in Union Square are selling vanilla bean porter kits. You can put craft beer kits on your [wedding] registry!” They’re even selling craft beer kits at Bed Bath & Beyond. My own beer palate isn’t as developed as Henry’s but I’ve had enough drafts to know when the beer has gone bad, and every now and then I’ll send one back. “The state of draft beer is horrible,” says Henry. “I would not order draft beer outside of a craft beer bar.” He says the lines—those are the hoses between the kegs and the taps—should be ideally cleaned once every two weeks. The Pony Bar does this, but many places don’t clean nearly as often–if ever. He went on to work for Craft Brewers Guild outside of Boston. Working as a sales rep, he learned the “business of beer,” and met many people in the industry who shared his passion for craft beer.